It’s June 20, 2006. I’m on my feet, desperately hoping that the Dallas Mavericks I’ve so greatly grown attached to don’t blow a 2-0 lead and lose in the NBA Finals to the Miami Heat. Dwyane Wade and Shaquille O’Neal had stormed back and were on the glimpse of an NBA title with a 3-2 series lead. Wade had taken over the series and scored around 40 points a game while shooting 73 free throws over the course of 4 games. It was 95-92 as Jason Terry raced down the court and rose up for a shot to tie the game. Right as he shot it, the power went out in the house, but I knew exactly what happened anyway. He missed the shot. I remember our family walking outside the house to see that the entire block had lost power, but no one really cared about that. The hopes that the Mavs would finally win a championship were lost. This was a Dallas Mavericks team that had never reached the NBA Finals since the team’s inception, and everyone in Dallas had their eyes glued to the screen in June to see if they could do it. Unfortunately, they couldn’t win the big one, and as a young kid who grew up going to Maverick games all the time and watching them religiously, this was an absolutely heartbreaking moment for me. Relatively, I was a spoiled Mavericks fan as I had only known the team with their 7’0 Hall of Fame sharpshooter, Dirk Nowitzki. Regardless, I had never witnessed my team make it to the championship stage, and this was the first time in my life that my hopes had been shattered like that. It totally changed my perception of how the life works. I no longer had that feeling of a kid who looks at everything with rose-colored glasses. Even after the Mavs went 67-15 and Dirk won the MVP award in the following season, I didn’t have the kind of hopes that I had the previous year. I remember watching the first few games of the first round series against the 8th-seeded Golden State Warriors team, and just knew that this was not going to be the year. The young Warriors led by Baron Davis had the Mavs’ number and seemed to control every facet of the game from the get-go. I didn’t even watch the last 2 games of that series because I didn’t want the feeling of having my heart wrenched out of me like it did the last year. After their terrific run to the NBA Finals in 2006, the Mavs would make to the playoffs every year but only managed to make it to the second round once. During this time, I was still an avid fan that went to many games, but I was lost. As a kid, I was used to watching Disney movies with fairy-tale endings. After all the early playoff exits, I realized that’s not how life works. My hopes, however, changed drastically when the Mavericks traded for Jason Kidd. It was a new outlook for the Mavs, as they had just received a Hall of Fame point guard to fill a position that was a hole in the team for years. I remember the day when I was eating lunch with my family and my dad told me that this trade had happened, and I immediately was ecstatic. Finally, there was hope. Over the next few years, the team would struggle in the playoffs as they got accustomed to playing with one another and they desperately needed a defensive anchor. The likes of Erick Dampier and DeSagana Diop over the years was frankly not good enough. On July 23, 2010, the Mavericks traded Erick Dampier, Matt Carroll and Eduardo Nájera for Tyson Chandler. This was one of the most lopsided trades in NBA history. Chandler had been traded around the league since he was drafted, as he never really found a place where he fit in and could stay healthy. When this happened, I had no idea the kind of impact that Tyson Chandler was going to have on the team. Growing up a Mavs fan, we never truly had a rim-protecting center like Chandler. I only understood guys that could score, but Tyson quickly taught me that every player on the team matters. He was the grit that the team so desperately needed. Just as the Mavericks seemed to have hope in the 2010-2011 season, Caron Butler, their high scoring All-Star small forward, went down with a ruptured right patellar tendon. This took the life of me as a Mavs fan that finally felt like we had a shot. I remember this injury made me so mad that I just jumped to the conclusion that this was the final straw that Dirk was never going to lead the Mavs to a championship. However, the Mavs continued to play well and adjusted better than expected to losing one of their premier scorers. Since 2006, this was the year that I finally felt like the Mavs had something in the making here. 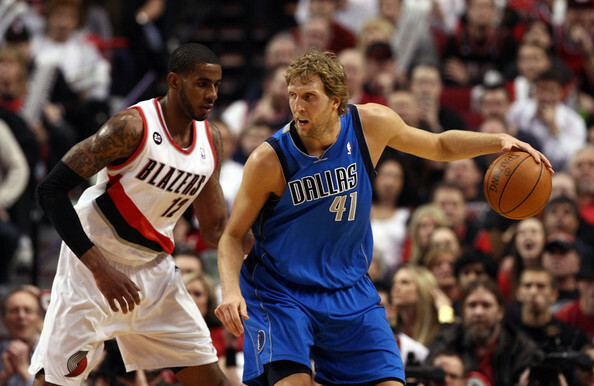 The Mavs ended up with the 3rd seed in the Western Conference and would face the Portland Trailblazers led by young and rising superstars, Brandon Roy and Lamarcus Aldridge. The Mavs won the first two games in Dallas and lost the third in Portland. In Game 4, Dallas led by 23 in the 3rd quarter and 18 in the 4th quarter as they looked to take a 3-1 lead in the series. Brandon Roy, however, was not going to go down without a fight. He hit ridiculous shot after ridiculous shot and my heart was pounding as it felt like the Mavs were about to blow an opportunity once again. Roy would bank in a floater with under a minute to go to take an 84-82 lead that would end up being the game-winning basket. My hopes, once again, were shot. The Mavs, however, kept fighting and ended up winning the last two games of the series handily. In the second round, the Mavs would be facing the back-to-back champion Los Angeles Lakers led by Kobe Bryant. I remember thinking that there was no way the Mavs could beat this juggernaut of a team. However, they continued to defy odds by winning by 2 points in a hard-fought Game 1 where J.J. Barea shined to steal home court. I figured this was just some championship rust for the Lakers and that they would come back with a vengeance, but it was the Mavs who came out with something to prove in Game 2, winning the game 96-84. As I arrived at the American Airlines Center for Game 3, there was a buzz in the arena that I had never felt before. There was hope that this Mavericks team was going to dethrone the Lakers after taking the first two games on the road. Dirk’s 32 points in Game 3 led the way as the Mavs now had an opportunity to sweep the team that has dominated the NBA over the past few years. In Game 4, the Mavs came out like they wanted to show the world that the first three games were not flukes. The Mavs would make 20 of their 32 attempted three-pointers, as Jason Terry hit 9 and Peja Stojakovic hit 6. At this point, my hopes are through the roof. As the Western Conference Finals rolled around, I felt as if there was no way the young Oklahoma City Thunder could take down this red-hot Mavericks team. Even though the Thunder had Kevin Durant, Russell Westbrook, and James Harden, we felt on top of the world. In Game 1, I remember the American Airlines Center cheering on Dirk like never before as he poured in 48 points. It seemed like the Thunder didn’t have anyone who could guard Dirk. As the Mavs headed to Oklahoma City with a 2-0 series lead, the Thunder seemed to have a chip on their shoulder. They came out of the gates strong, and they led by 15 with about 5 minutes to go in the 4th quarter. My dad’s friend, our neighbor, was over at our house to watch the game as he always was. At this point, he was leaving and said, “If the Mavs win this game, I’ll come back and jump in the pool.” Dirk, however, had something to say for it. In those last five minutes, I could see the killer instinct in Dirk’s eyes as he hit shot after shot to eventually force the game into overtime. Shawn Marion especially shined as he blocked Kevin Durant’s attempt at a buzzer-beater to end regulation. He was not going to let the Thunder get in the way of his chance to finally redeem himself. He put the team on his back and won the game in overtime. Needless to say, our neighbor came back to our house and jumped in the pool. Going forward, we would jump in the pool every road game that the Mavs would win. In Game 5, the Mavs won a hard-fought game by four points and were headed to the NBA Finals for the first time since 2006. The goal was right in front of them. It felt like this was the year that the Mavs would break through and avenge their 2006 catastrophe. 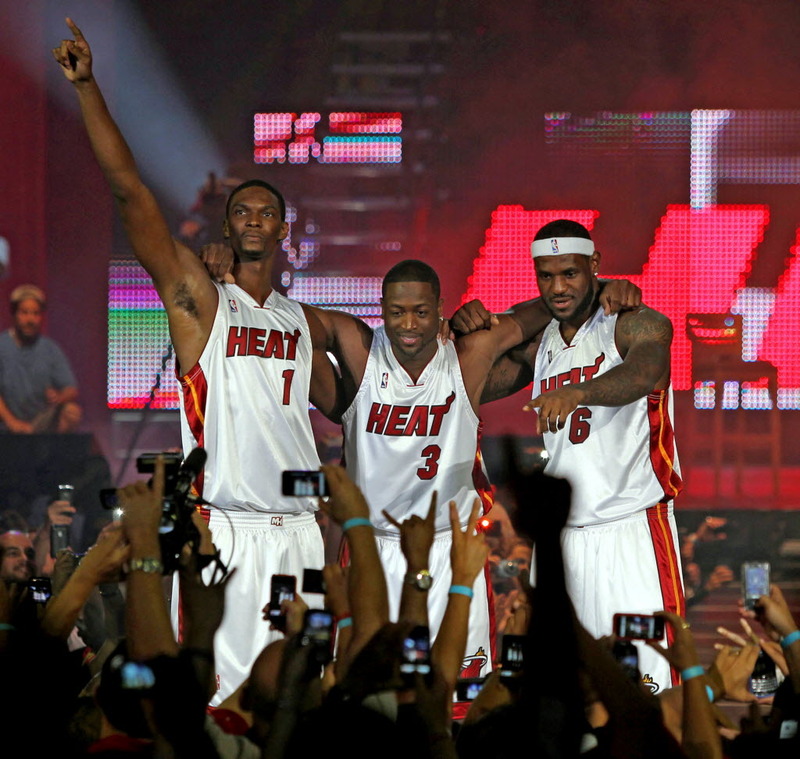 However, Lebron James, Dwyane Wade, and Chris Bosh had formed a “superteam” out in the Eastern Conference. LeBron, the best player in the league, couldn’t seem to win a championship in Cleveland, so he “took [his] talents to South Beach” and joined up with two perennial All-Stars in Miami. The Heat had been the villains of the league all season and had high expectations. It was either championship or bust for this team. The three stars took less money to win championships, and they were looking across the way at a Mavericks team with one All-Star like they were about to waltz their way to an NBA title. 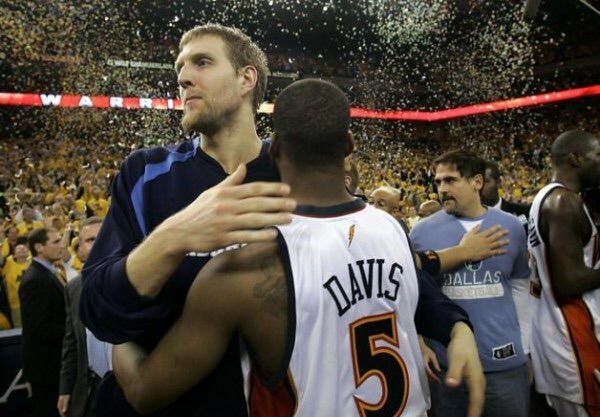 This was the Mavericks chance to win the NBA title like they should’ve in 2006, and it made it even sweeter that it was against the same opponent. In Game 1, Dallas struggled to find a rhythm. The ultra-talented Heat seemed like a beast that couldn’t be taken down. I remember being so incredibly mad that I stormed out of the room and didn’t watch the end of the game. I felt as if LeBron’s “The Decision” was about to crush the dreams of Maverick fans everywhere. With around 5 minutes to go in Game 2 with the Mavericks down 1-0 in the series, I will never forget when Dwyane Wade hit a corner three to take an 88-73 lead for the Heat. All hope seemed lost. Just when it seemed like the Mavs were about to lose control of the series, they fought back. Similar to how the Mavs stormed back from down by 15 against the Thunder in Game 4, the Mavs showed up when it counted. As the Mavs managed to tie the game with under a minute to go, they found themselves with the ball. Tyson Chandler set one of the best screens I’ve ever seen for Dirk to give him to have a wide-open look at a three-pointer from the wing. I didn’t even need to look, I knew Dirk was going to hit that shot. The next play, Mario Chalmers got free and made a corner three to tie the game just when it seemed like the Mavs had stolen a game on the road. 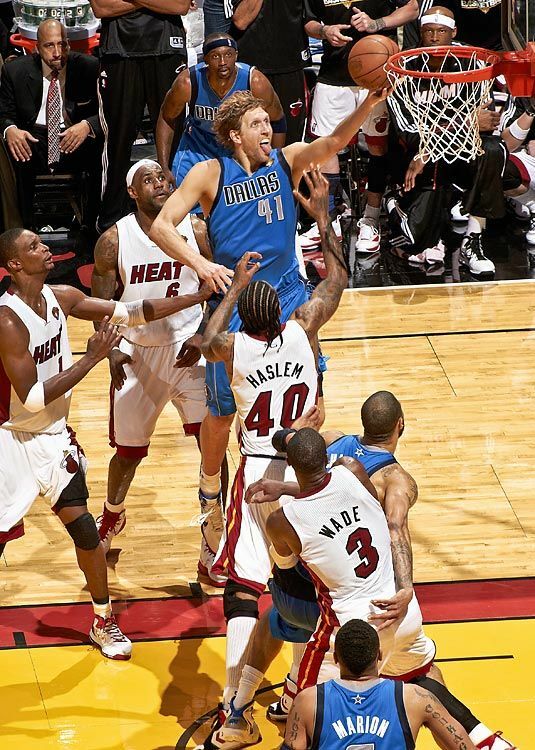 The Mavs turned to Dirk, who would drive by Chris Bosh and make a game-winning layup that would win Game 2 for the Mavs in the greatest comeback in NBA Finals history. Game 3 was the first NBA Finals game I had ever been to. I was in shock and incredibly stoked that this was even happening. However, the Mavs would lose the game 88-86 after Dirk missed a shot to tie the game late. The Heat now had an opportunity to live up to their expectations and take a 3-1 series lead if they could win Game 4. I had confidence that the Mavs could fight back and win this game with their backs against the wall. Then, I heard the news. Dirk had a 102-degree fever heading into Game 4. Right when the Mavs seemed to have a chance at redemption, our best player gets hurt in one of the biggest games of the history of the team. This is when guys like Jason Terry, Shawn Marion, J.J. Barea and Tyson Chandler knew that they needed to step up. Terry especially came out firing, as he was not going to let Dirk getting sick prevent him from getting the championship he deserved. The game came down to the wire, and the Mavs won the game with heart and tremendous defense by 3 points. Game 5 seemed like the opportunity for the Mavs to put themselves in position to win the series. The Mavs seemed to control every aspect of the game and looked like an offense that could not be stopped as they took a 3-2 series lead heading to Miami with a chance to win the title. As Game 6 rolled around, it was one of those moments where it was so surreal that it went by too fast. The Mavs came into the arena wearing all-black suits and looked like they meant business. It was the funeral for the Miami Heat. Dallas looked like a team to be reckoned with in this game, just like in Game 5. They seemed like nothing could stop them in their quest for a title. Jason Terry had an exceptional game, as he was the vocal leader of this team even back in 2006 and was not going to back down from this opportunity. In fact, he got a tattoo of the NBA championship trophy on his bicep before the season because he felt like this was the team that was going to win it all to redeem the 2006 collapse. The Mavs held a steady lead in the game, but it was their clutch play down the stretch that won them the game. I remember watching as we held around a 10-point lead late in the game and thinking to myself, “Is this really happening?” When Dirk hit a short corner shot and walked down the court with a clenched fist, I knew that what I had dreamed of was about to happen. In between plays, Dirk, Kidd, and Terry would be hugging as they knew the game was out of reach for the Heat. All that these guys had fought through, and they finally were able to achieve what they set out for. The Mavs won Game 6, 105-95, and the NBA title was theirs. I was elated. I thought back to 2006 when everything seemed to be ripped away from the team and my perception had changed. Fairy-tales weren’t real. Now, after witnessing the team that everyone doubted take down the back-to-back champions and the “superteam” that was the Miami Heat, my life was changed. I learned that, in sports and in life, even when it seems like your back is against the wall and no one believes you can do it, you can achieve what you set out to do if you put your mind to it. This was a group of guys that believed they could do something no one else thought they could all season. No one thought they could’ve overcome the Caron Butler injury. No one thought they could’ve bounced back after a devastating Game 4 loss to Portland. No one thought they could take down the one-seeded, defending-champion Lakers. No one thought they could come back to beat a rising Thunder team when trailing by 15 with 5 minutes to go. Finally, no one thought they could take down the team that was formed to win championships with ease. David took down Goliath. 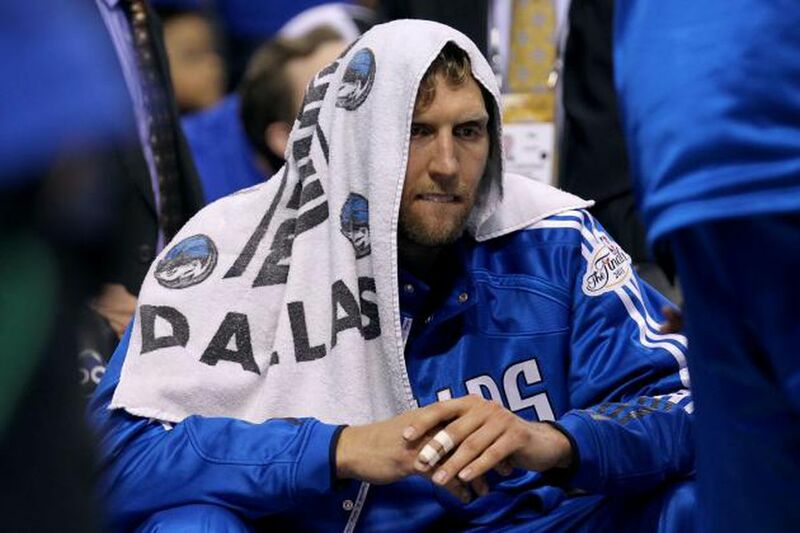 In the end, we are all like the 2011 Dallas Mavericks. We face tremendous challenges, get beat up and told we can’t do it. The key is to push that aside, put your mind to it, and achieve what you set out to do, just like the 2011 Dallas Mavericks.